When I planned my Dubai trip, one thing I wanted to try for sure was flyboarding. The videos floating on the net were super exciting and with a price tag of around 300 AED, I felt I can give it a try. However the attempt didn’t go very well. This post shares my complete experience on trying flyboarding- Booking process and actual experience. 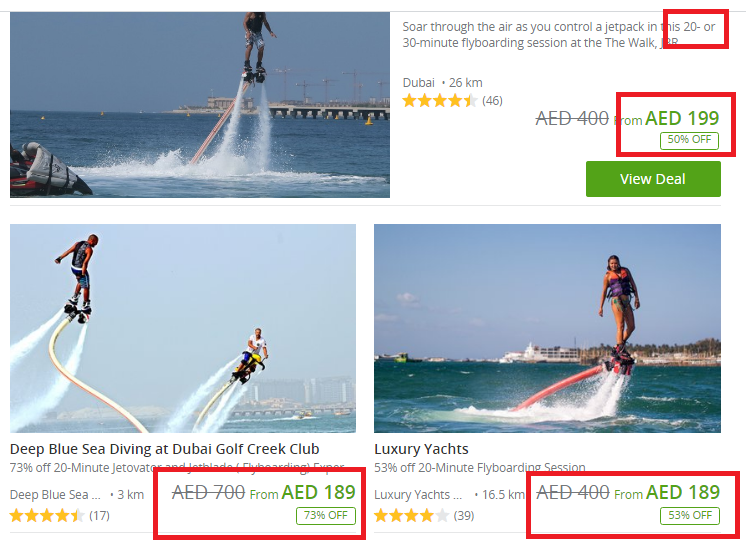 Groupon website showing original price at an inflated level of 400/700 AED was a turn off for me, as I realize that they're faking original price to show increased discount. The location of Searide Dubai felt closer to Burj Khalifa and other places I wanted to visit. Few other operators I checked had their venue further away. 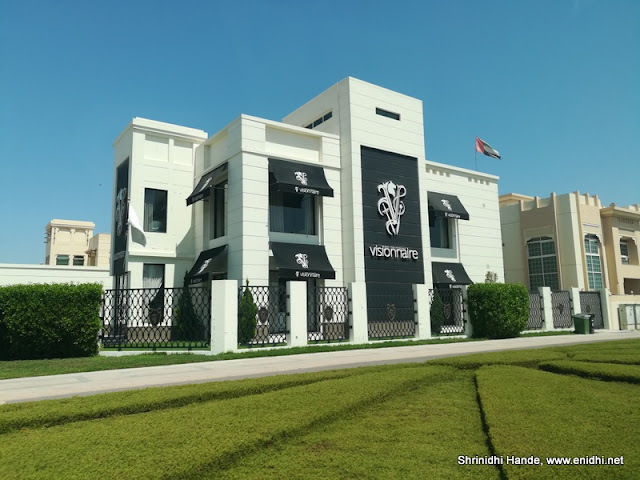 With this much research and a bit of whatsapp discussion with Searide Dubai and a friend of mine in Dubai, I decided to go with Searide Dubai. Searide.com’s website isn’t the best designed one. I couldn’t select two slots in one booking- had to add one slot to the cart, go to final page, then do some circus and add second one. In this process I selected a wrong date for second slot. 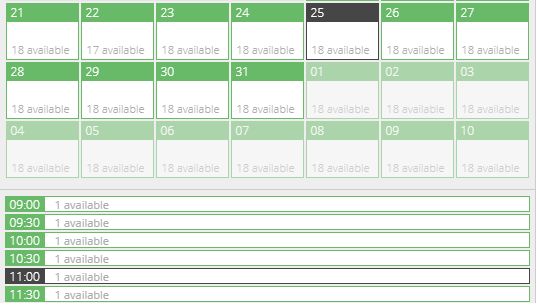 Thankfully Searide guys gave good support via whatsapp and email to confirm that I can have 2 slots on Friday, 20th and can ignore the wrong date selected on booking. There was no immediate confirmation. Email confirmation only came next day. I paid 630 AED for 2 slots- paid via credit card. Looking back, this feels like a mistake. Note that even confirmation doesn't call out that ride duration is only 20 minutes. Since the slots were 30 min each, I thought I will get 30 minutes. 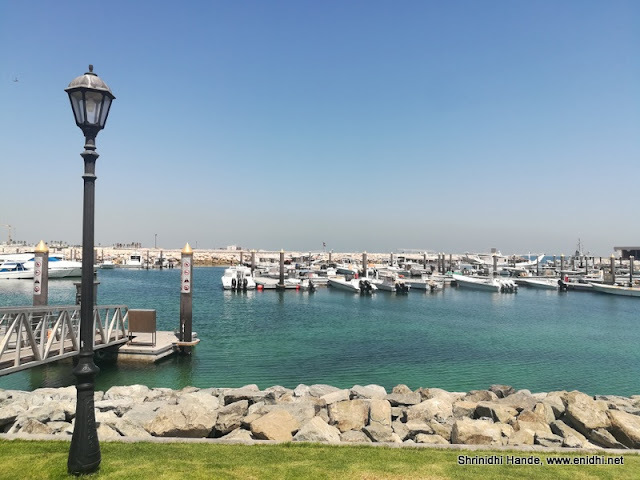 My original thought was to book for afternoon- but Searide Dubai suggested that sea is calmer in the morning and I should book an earlier slot. But my flight arrival was same day morning- I had to factor a few hours possible delay and travel time to Searide Dubai location, hence I selected 1 PM. Further, I see lots of slots available on almost all day on the website- probably it is fine to just walkin-prior booking is NOT mandatory- there isn’t a lot of demand-at least this is what I feel- use your discretion. But there’s no discount for walk-in customers either- usually since payment is immediate and no bank charges are involved, some companies can afford to give some concession for spot cash payment. I did some preparation by reading about flyboarding. There weren't too many blogs. This and this posts were useful. Blogger Mridula had written about her short stint at Flyboarding in Thailand. There were a few good videos as well. We arrived early- the directions given on the Searide Dubai's website was useful. We need to take a turn after this building to reach the wharf. We reached bit earlier than planned- reached there by 11.30 AM instead of scheduled 1 PM. There were no other customers so Searide Dubai accommodated our time change request without any issue (informed them over WhatsApp). Nowhere on the website it could be seen that action time is only 20 minutes. Since the booking slots are of 30 minute duration, I had assumed we will get 30 minutes of flyboarding, compared to cheaper options which were only for 20 minutes. 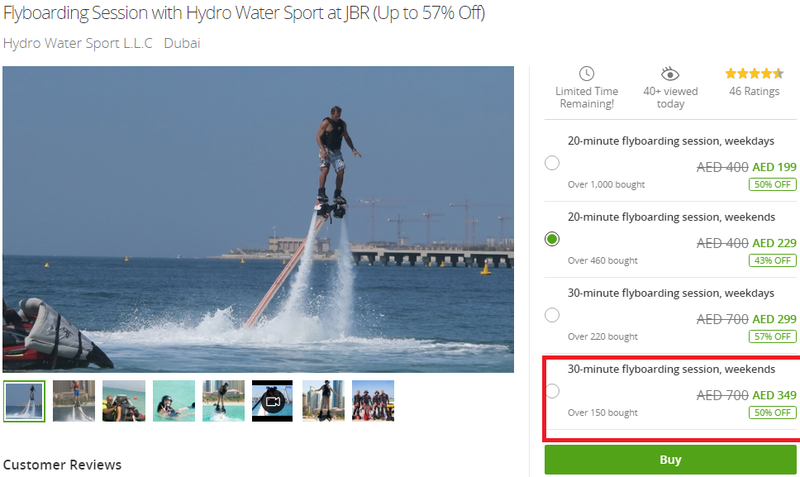 This was the main reason I overlooked 210 AED pricing on groupon, thinking I will get 10 extra minutes, so 315 AED is fine.This was probably my fault not reading carefully, or Searide Dubai’s clever marketing. The staff there, Steve from France wouldn’t accept our argument that we had paid for 30 mins.I couldn't prove that it is 30 minutes as duration was never mentioned anywhere. I totally felt cheated at this point. I took this up with SeaRide Dubai on WhatsApp later- they again insisted that it is clearly mentioned somewhere that 10 minutes briefing and 20 min ride- I couldn't locate this text anywhere on their website. I've asked them to provide a screenshot, waiting for the same. Update: Sea-ride Dubai WhatsApp support agreed that English version of the website doesn't list duration of the activity anywhere. This is basic information, so I consider this misrepresentation of facts and cheating. A quick practice session inside the creek would have helped us gain some practice/confidence. Instead we were taken directly into ocean, where waves are high. I know swimming, which is a pre-requisite for flyboarding but not an expert in ocean swimming. Lot of my energy went into ensuring sea water doesn’t enter my mouth. 4. Photos- There's no extra charge for photos, which is good but Searide Dubai won’t give your photos/videos directly to you. They say they will post in on their facebook group and we have to take it from there. 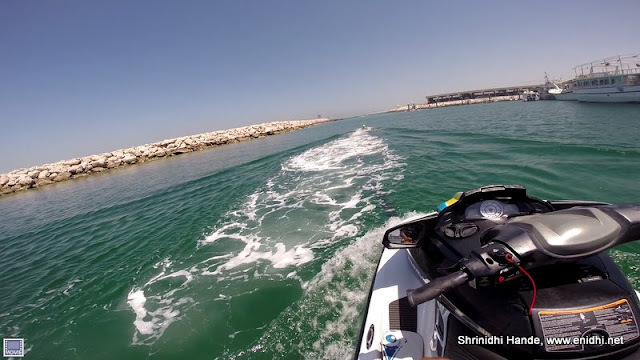 The rider needs to wear a heavy boot, which is connected to jetski with the hose pipe- 50 meters long-this can propel one in air for upto about 10 meters (remaining 40 meters needed to maintain some distance from Jetski). The extra ordinary videos you see on Youtube will have much longer hoses-100-150 meters. Flyboarding uses JetSki's propelling power to pump water through the hose. By directing the waterjet pressure downwards, one can rise in the air. Once you manage to stand steady, you can try some body movements and stunts. For most beginners, standing steady for several seconds will be the first challenge, before they can do anything else. At the creek we were given a life jacket and helmet. A brief was given-one person had to wear the flyboarding boots and sail slowly out of the creek. (since Jetski's power is diverted to flyboard, it is not possible for 2-3 people to sit on JetSki, ride out to sea and then begin flyboarding. With the hose attached, Jetski can slowly move forward with a student in water leading. Once in open sea the attempts to stand on one's leg began and it wasn't easy. To stand up, one should be able to push the legs vertically down, so that water from the hose is directed vertically down to push the student up. Any inclination (angle) will push the student at an angle which will result in falling back into water. After each fall one needs to flip over to get back to take off position- this felt a tiresome process due to heavy boots. Another thing to remember never face the jetski while flyboarding. In such cases, instructor will slowly drop the throttle and let you fall into water. This is to avoid collision with student and jetski. So always face away from JetSki. A friend- Rutavi Mehta who went before me managed to stay afloat for a few seconds. I couldn't manage even that. During the 15-20 minutes I got to practice, I couldn’t get up on my legs. Partly because I struggled a bit swallowing salt water and partly because flipping over to right position was difficult due to heavy boot. Another important thing is coordination between you and instructor- unless the instructor turns jetski throttle, there’ll be no water gushing under your foot. Coordinating the same is also crucial. Steve, our instructor said most first time students of flyboarding learn to stand up in 5-10 minutes. May be true. I will need another practice session to get some success at flyboarding. Will try again whenever I get another opportunity. Our 20 minutes were over before we knew it. 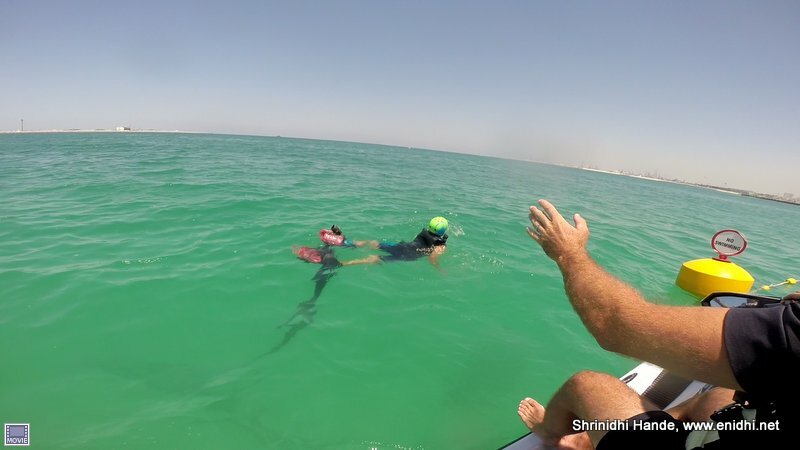 For the first timers, if there's an option to practice in freshwater it will be great- no need to fight waves and salt water. But I don't know if such an option exists. Most flyboarding sessions seem to be done in sea water only. Q: Can we carry lots of stuff? A small bag can be given to Searide Dubai staff for safekeeping while out for activity. Large bags possible but with some difficulty. Yes, the wharf has bathroom facilities for men and women. No locker room though. Q: Can we carry stuff like camera while on Jetski? Yes. JetSki has a small pouch where sunglasses, camera can be kept if required. However avoid carrying stuff that are not water resistant. Q: What kind of GoPro mount is suitable? Chest Mount, Helmet mount and Wrist mount can be tried. Helmet they give may not have a mount- you will have to carry your own. Chest mount is best. Best video is done by someone sitting on the jetskip- the instructor themselves or your friend sitting behind. Instructor will need one of his hand to control Jetski throttle, so he can’t be shooting non-stop. Q: Do they (Searide Dubai) provide refreshments? Q: Do they (SeaRide Dubai) folks take picture? Q: What are the pre-requisites for FlyBoarding? One should know swimming- preferably ocean swimming. Weight should be less than 80 kgs. Critical illness like back-pain etc are a negative. Duration (20, 30, 60 minutes etc). if you're booking 60 minutes I suggest booking 2 separate slots of 30 minutes each- you will get exhausted, so some rest/break in between will be good. Length of the hose pipe also plays a role for serious players- not easy to find out- first timers can possibly ignore this. Time- if sea is calmer, you can practice better. If waves are higher, you will have to spend more energy trying to prevent saltwater entering your eyes, mouth. I don't have any experience with other operators to compare and suggest if Searide Dubai is best or not. I felt cheated on the timing part-not clarifying that it is 20 minutes only. Next time I will be more careful and will try some other operator.